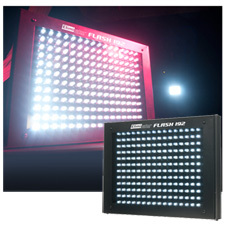 The Eliminator Lighting Flash 192 is our new energy efficient Flash Strobe Panel packed with 192x ultra bright high end White LEDs. It offers 4 Channel modes, can be controlled via DMX, Master/Slave mode, Auto and Sound Active. The Flash 192 also offers 3-pin XLR & IEC (share power source) in & out connections to daisy chain with multiple Flash 192s. With the use of LEDs this panel becomes energy efficient without the sacrifice of visual power and has a minimum power consumption of 15W full on! 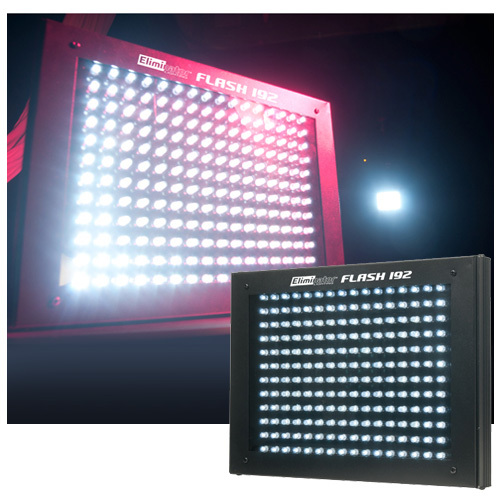 Light weight and slim design also makes it easy for the Flash 192 to be transported from gig to gig, and the best part of it all is that because it uses LEDs the Flash 192 emits little to no heat whatsoever and manages to keep cool through the entire night - you can't go wrong. Power Cord Daisy Chain: 25 Fixtures Max.